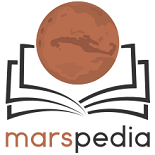 This is the global collection of articles that are needed by Marspedia and shall be a guide for authors, who want to start new articles without knowing which direction to go. What are the different topologies on Mars? What do the differences in gravity show us? What minerals could be mined on Mars? This page was last edited on 8 April 2019, at 04:49.